Vibrant shades of red and purple saturate the leaves of Acer rubrum 'Brandywine' in autumn. It's reliability to produce this long lasting, spectacular display makes it one of the best Red Maples for autumn colour. The maple leaves emerge pale yellow, darkening to green in summer, before the autumn display. Neat little spring flowers add further interest. This Red Maple tree has an elegant oval crown and will reach around 7 x 3.5 metres in 20 years. Acer 'Brandywine' will suit a sunny or partially shaded position in most soils, preferring neutral or acidic types. 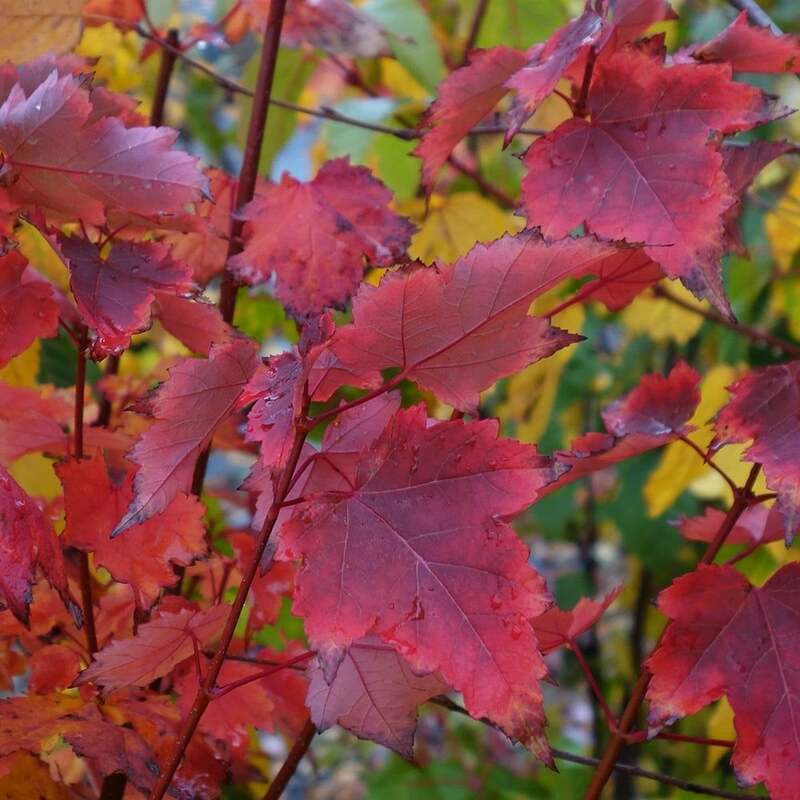 Our pot grown Brandywine Red Maple trees can be planted at any time of the year. Start by removing weeds and grass within a metre of your desired planting hole, then dig a square hole as deep as the root mass and roughly 2x as wide. To help the tree establish more effectively, sprinkle root grow in the hole. We recommend planting Brandywine Canadian Maple trees with a staking kit. For single stakes, knock the stake in at an angle and use a buckle tie with a spacer to prevent chaffing. For more advice, visit the help section. If you’re planting Red Maple trees in spring or summer, water well for the first few months. Increase watering if there are extended periods of hot or dry weather. If planting in autumn, you may only need to water a little. Brandywine Red Maple trees do not require regular pruning. If you wish to tidy up your Red Maple tree, do this during the dormant season. Focus on removing any damaged, diseased or overcrowded branches. If you require a clear trunk, remove any side shoots to help raise the crown.